Vital Tea Leaf is a diamond in the rough. Chinatown in San Francisco can be overwhelming. The shops that line the sidewalks range from kitschy to flagrant tourist traps. The uninitiated can unknowingly wander into a Disney World kind of Chinese experience, but the discerning eye can find more than a few gems nestled between gaudy statue sellers and discount clothing stores. Vital Tea Leaf is one of these gems. As with most great places you’ll find, I learned about Vital Tea Leaf from someone else; a complete stranger, in fact. I was at a dive bar way out in the Financial District at an engagement party when I this stranger and I started chatting like you do with randoms at bars. I don’t remember how the subject came up, but we wound up on the topic of tea. He promptly told me about his friend Hunter at Vital Tea and recommended I look him up. It took me a couple months, but I finally made it. 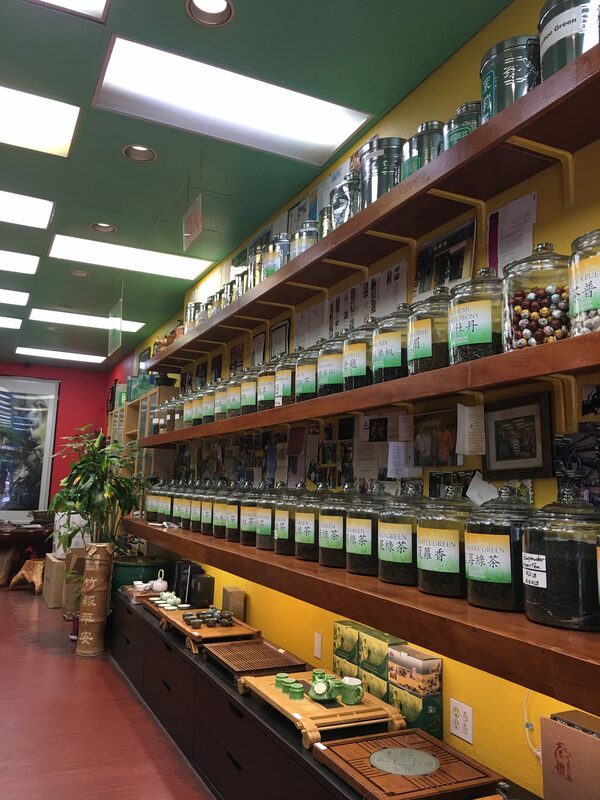 Vital Tea Leaf is at the tail end of Grant Street, which runs straight through the heart of Chinatown and dumps out into North Beach (the Italian area of the city). Turns out I’d been there before to hit up the Golden Gate Bakery right across the street and score some of their famous Chinese egg tarts (if you go get ready to wait). Without realizing it I was standing in front of a gem of a tea shop. When I walked in Hunter was already in the middle of running a line of customers through a series of teas at their tea bar. My wife and I headed to the back of the store and made ourselves busy perusing the tea ware. Before long the bar cleared out and Hunter came over to greet us. 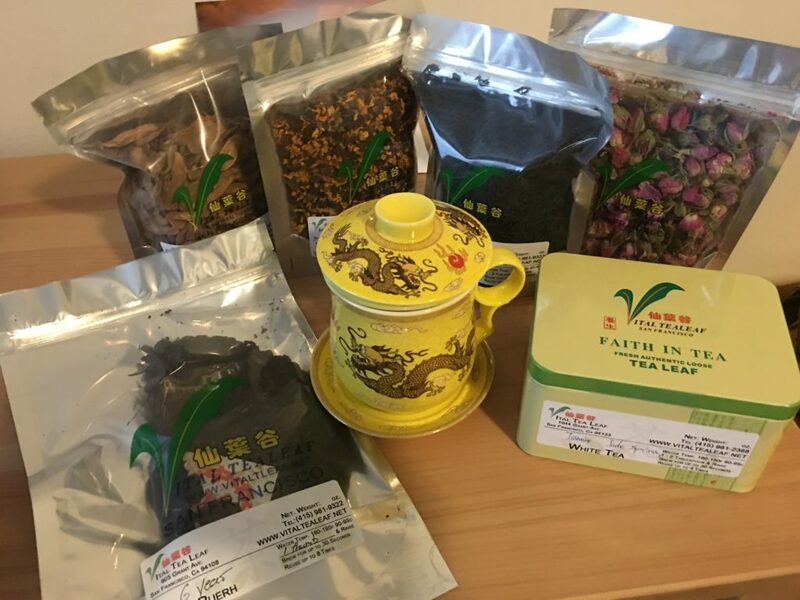 I mentioned I was here on a recommendation from his friend, which made him smile, and he asked if we were interested in trying out some tea. Well, yeah! He brought us over to the tea bar and it was time to get down to business. A nice long tea bar full of gaiwans and ready-to-brew teas. We started with the oolongs, at my request. Hunter’s opening salvo was a rolled oolong dusted in ginger. It was a good tea with a distinct spice and sweetness of fresh ginger but I’ll be honest, I forgot it fairly quickly because I’m not one for flavored teas and he followed it with a Dong Ding I couldn’t wait to taste. The Dong Ding was from the Fall harvest and it was pleasantly fresh and “green” with a pleasant floral tone and a smooth fruity sweetness. Another customer joined us at the bar and he asked to take the train to puerh town. Oolong time was over. Dong Ding Oolong. The cups and trays were just as enjoyable as the tea! Hunter brought us a 6-year puer, which was slightly smoked with a deep red-brown color like a dark clay. He followed up with a 10-year that was heavy and smoky and overwhelmed me as a novice puerh drinker. We came back around to a different 6-year and it hit the spot with flavors of sweet moss and moist forest floor. From there we headed into the land of flower teas, which is something I’ve never enjoyed but they’re my wife’s favorite. 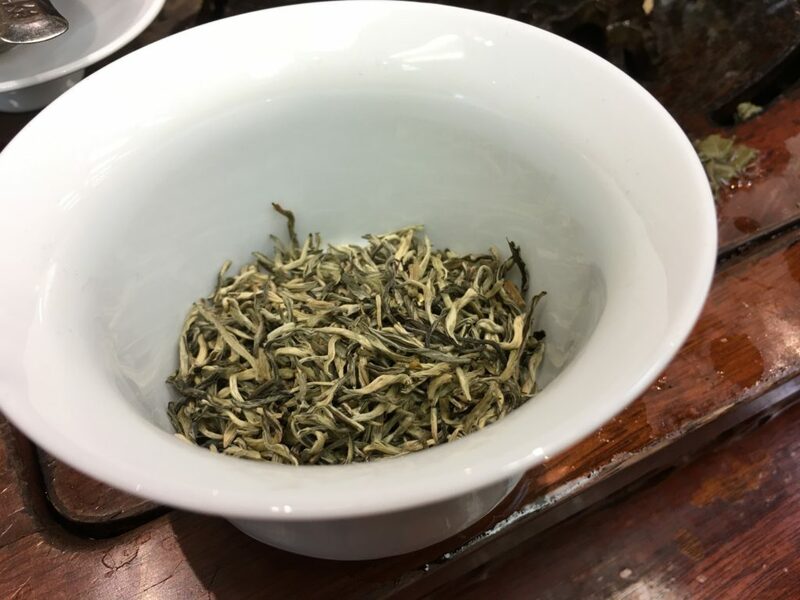 We started with a jasmine white tea that absolutely shocked me with its flavor. Again, I generally dislike flavored teas because of the prevalence of chemical additives to create flavors. 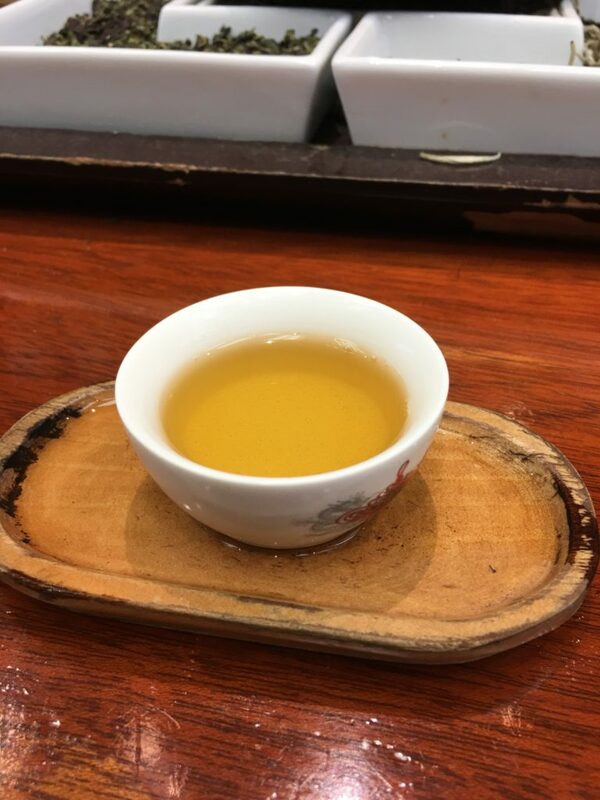 Flower teas in particular are something I’ve avoided since my days living in China (jasmine and chrysanthemum tea are very commonly served at restaurants there) simply because I did not enjoy them in the past. But this tea made me sit up and pay attention. Hunter followed it up with a snow chrysanthemum tea that was absolutely unlike anything I’d ever tasted before. It was slightly spicy and sweet in an almost honey-like manner. It lacked any kind of bitterness or astringency one gets from brewing tea leaves. It’s caffeine free nature and soothing effect has made it a new favorite post-dinner, pre-bedtime drink. I was fully on board the flower train at this point, but Hunter had one last rose tea to complete the three-punch combination he was brewing up. The roses grow in the mountains near Siberia in the northeast of China. When brewed they have a beautiful but not overpowering rose aroma and a pleasant sweetness, with a slight tinge of vegetal green flavor. I might try mixing this with some similarly floral oolong at some point and see how they play together. Beautiful white tea buds infused with a strong but not overpowering jasmine scent. At this point I was afraid we had run out of tea and time, but Hunter graciously kept on brewing. We started to talk about the health and medicinal benefits of tea and that brought us into the realm of red, yellow, and rock teas. 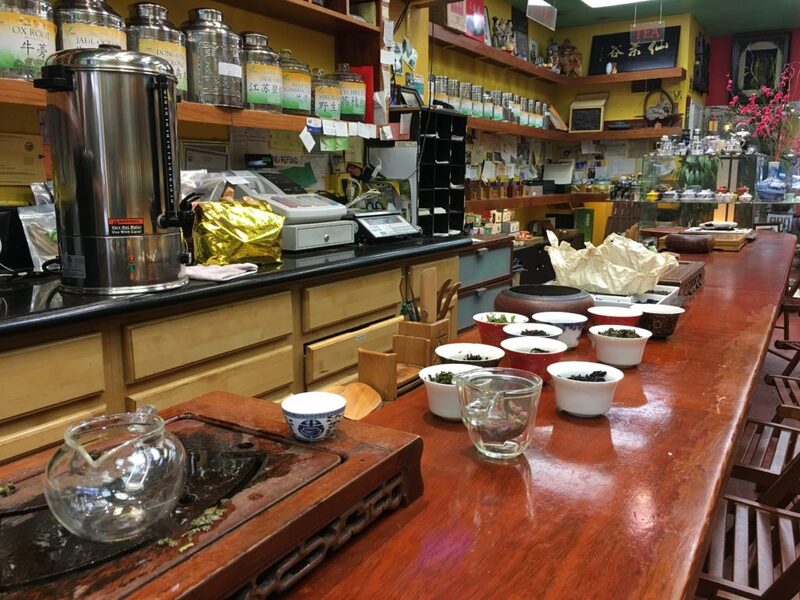 We tried a variety of herbal teas, and we later bought some ox root tea, but what got me was a pair of Lapsang Souchong teas and a yellow Ying De #9. The first Lapsang was a bit too on the heavy side for me. It had a sour, vinegary taste on the back of my tongue that shocked me. I’d never tasted anything like that in tea before. My guess is it was a result of the heavy smoking process that particular tea went through. That’s not to say it was bad tea, but it was new. Hunter followed up with a “base” Lapsang that landed smack dab in the center of my tea tastes and quickly added it to my collection. We wrapped with the yellow “Hero #9” tea, which was delicious but I passed on it for the time being as I already have a great yellow in my cabinet at home I’m working on and my budget only allowed for so many new teas. These count as groceries in the budget. Worth every dime! All in all, it was quite a journey of tea exploration. Hunter’s knowledge and passion for tea opened my mind to a new world of teas I previously ignored. His enthusiasm and enjoyment of tea is palpable and it made drinking good tea that much better. This was actually my first time going through a tea session like this of any kind, and the Vital Leaf made it a great memory. If you’re ever in town, make a point of stopping by and tell them Mike sent you! Love your descriptions……do they do mail order?